The British home secretary has met the prime minister of Pakistan as a new partnership between the two countries to fight terror is announced. 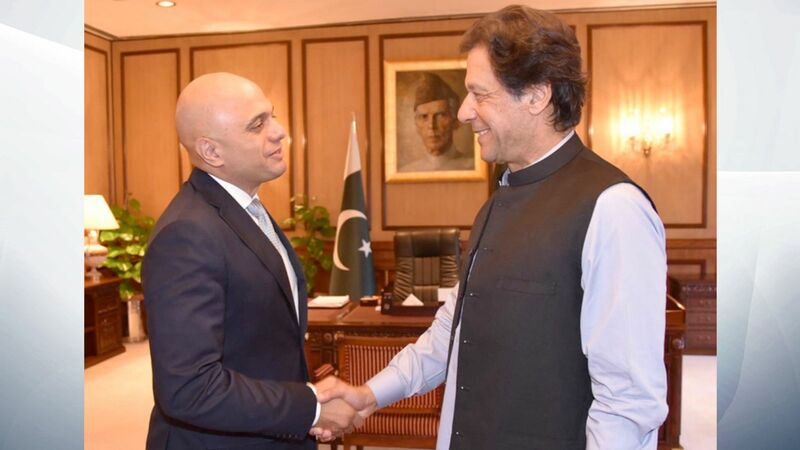 Sajid Javid, the son of Pakistani immigrants, was pictured shaking hands with the newly elected Imran Khan during a visit to Pakistan. It comes as a new partnership has been announced between the two nations to eradicate corruption and tackle terror. Speaking in Islamabad, Mr Javid said the partnership will strive for “justice and accountability”. He said “no one can escape justice or act with impunity” and urged for a “more concerted action” to combat terror groups. Shortly after the meeting, the Twitter account for Mr Khan’s party, Pakistan Tehreek-e-Insaf, tweeted a photo of the politicians shaking hands. Mr Javid also met with the country’s foreign minister Shah Mehmood Qureshi. The pair discussed security and terrorism. He also spent time with law minister Farogh Nasim. The home secretary said they discussed security issues and mechanisms for bilateral prisoner transfers, as well as money laundering, trade and education. Mr Khan’s government has pledged corruption-free governance and has promised to return to Pakistan allegedly stolen public money.